Decorative Garden Taps - These ornamental garden taps come in various designs and in two finishes, polished brass and antique bronze like finish and are mainly available in 1/2'' or 3/4'' size. Compatible rosettes and back plates are supplied as standard as is a hose bib fitting, that enables of most of the taps to be fitted with a hose pipe. These decorative taps would enhance the look of any garden, yard or driveway and any water feature. We stock many more water spouts and decorative garden taps and for viewing contact us. BRD064p and Back Plates in Polished Finish - These garden water taps, matching rosettes and back plates can be purchased separately and as needed. These taps can take 3/4'' inch hose-bibs. 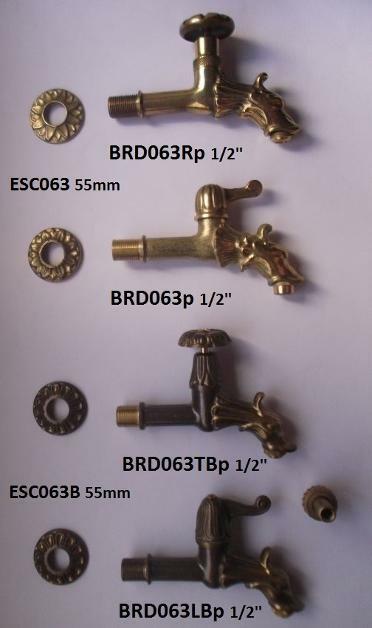 BRD063 Brass Spouts, Rosettes and Back Plates in Bronzed and Polished Finish - Theses 1/2inch BSP water spouts, matching rosettes and back plates can be purchased separately and as needed. These taps can take 3/4'' inch hose-bibs. Push Button Water Taps, Rosettes and Back Plates in Antique Bronze Finish - The water taps, matching rosettes and back plates can be purchased separately and as needed. The decorative garden taps displayed at MaltaWebShop.Com are marketed exclusively by Renaissance Arts Company Limited, Malta through MaltaWebShop.Com and a few other Selected Outlets. We accept Online Payment by Credit Card, Pay Pal or cash on delivery and deliver via courier, post or otherwise within Malta and Gozo only. Within Malta we can offer a 'see before you decide' option were we can arrange a meeting to View an Item before deciding to Buy or Otherwise. For complete information about ordering, shipping and returns please e-mail us at info@MaltaWebShop.Com .